Our first commercial fishing opener is still a month out but our brains are tuning into the real fishing channel, that of our livelihood. A light NW breeze said to us that it was time to get out of the islands with a high tide at 5:52 pm, a 17.6 footer. Not huge like the 21-footers or small like the 12-footers that cycle through, but perfectly convenient for the tasks for the day - launching one of our skiffs and then going to Adelia's site to get her nets so she can mend and re-hang them. There was half a day plus some to fill with projects before the rising tide made it attractive to loading nets. The first order of business was a sort of critical repair, welding cracks in the hull stiffeners of the skiff while it was still high and dry. Our aluminum skiffs are stout but the lighter-than-steel metal tends to flex in heavy seas. Like riding a mountain bike over moguls without shocks, we ride over and sometimes crash through the liquid waves to get where we need to go, so joints and stress points inevitably crack over time. These were on the bottom of the boat towards the bow, so Tollef crawled underneath, lying on his back to fix them up. Welding sometimes creates slag - molten metal that can fall off - and always sparks. Combine those with gravity, and the person under the welding gets a wonderful shower that results in some stopping and slapping afflicted burning pin pricks on exposed skin or through clothes. Oh, and cussing helps get through it, too. Adelia, who was up on the hill hanging web, could hear that part of the project clear as day! With the skiff repaired, it was ready to launch, which meant hooking it up to the already floating and operational skiff and towing it over small wood logs laid out as rollers. With a couple of tugs, she slid into the ocean, instantly metamorphosing from a heavy chunk of dead weight being inelegantly dragged down the beach to the agile, light, buoyant vessel she truly is. Like a duck is married to the water, so are our skiffs, each making its own tune or respiration as it gently floats, due to their unique hull shapes and way the waves jostle them in our little protected cove. As Adelia fired it up for the first time this year, she listened to the heartbeat coming from the outboard, a sound we fishermen tune in to like a cardiologist; each piston fired smoothly and the system was good to go. But we're always ready to notice a different tone, a potential weak link, or a problem to be addressed in the future. Once we were underway toward Adelia's site, it felt great to be waterborne again, out into the wide open bay. Like taking flight after being cooped up in the nest of the islands, we set our sights on the limitless water and mountains stretching far around us, enjoying the sensation of extending our field of view to the distant horizon, white peaks of the Alaska Peninsula 40 miles away. Whales spouted a mile or two ahead, clouds rested on the mountain tops. Automatically, our senses noted the wind direction and speed, cataloguing it for future reference; is it coming up, is the wind switching, how do the actual conditions relate to the forecast? The motor hums, sending us into a quiet, in-the-moment spot. The shoreline of Uganik Island approaches slowly, 5 miles away. Commuting to work but without a single other soul on the blue highway is a zen feeling that washes over our brains and is a stress reliever when the weather is nice. We can zone out and think slower, and with ear muffs on the noise of the motor becomes a distant hum and our other senses open up to the world around us. No rolled up windows and a climate controlled moving box here, which makes one really take note of the specific air temperatures and dress accordingly. Being cold on a skiff ride sharpens our focus on our bodies rather than broadening out to the horizon, so it's something we strive to avoid. Arrival at Trap 6 meant one thing: time for the pulling to begin. Unwrapping the nets from their tarp cocoon, we pulled them down off the bank where they're stored for the winter and pulled one into each of our skiffs - 150 fathoms each - hand over hand. There was just time to cover the garden beds with plastic to help the soil warm up for subsequent planting of food before we had to turn around and head back home to make sure we were there in time to unload before the tide started falling. 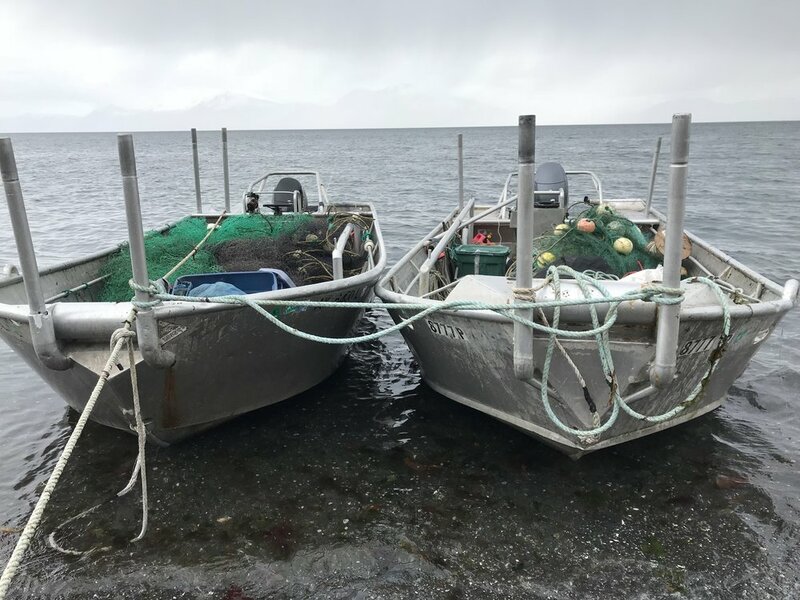 Once back home, the tarps were laid out again to protect the net from accumulating sticks, kelp, and sand, and then the pulling began again, this time out of the skiffs and up the hill, into position for Adelia to repair them. The workout was our preferred version of the gym, engaging hand strength, arms, shoulders, back and balancing with our legs, all the while reminding us that we have a ways to go yet to be in tip top shape for fishing. That evening, our gaze was often drawn to the two skiffs floating serenely on the running line. Seeing them both there, ready to take us places and to do tough work gave us a sense of completion. When our boats are in good shape and running smoothly, they are more than just our most valuable piece of equipment and source of transportation. Like an extension of ourselves, they are a symbol that things are right in our world, that we are ready to interact fully with our environment, the Pacific Ocean.